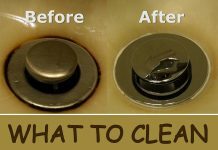 House cleaning is not such a burden if you have the right inside tips. Not even cleaning the bathroom, toilet or those greasy kitchen cabinets or stove top. If you follow some basic tips and tricks you will get your house sparkling in no time. When it comes to efficient and fast cleaning, baking soda is our friend. The same we can say about white vinegar. When the two are mixed, grease, hardened or burnt food remains are history. 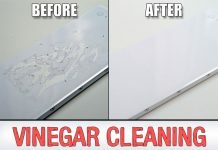 Therefore, you can use baking soda and vinegar to do pretty much all the cleaning in the kitchen, including cleaning the dishes, especially if we’re talking about burnt pans or blackened oven trays. To easily clean the bathroom, you can also use the two mixed together. You can also add hydrogen peroxide or peeled Castile soap. To that, you can add essential oils to make the mixture smell good. Just choose the scent that pleases your senses. Tea tree or lavender are widely used and quite popular, if you can’t make up your mind. 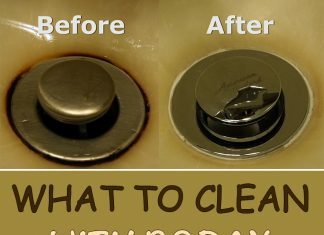 You can use distilled white vinegar to wash the spots off of the bathroom mirror. And you can mix it with baking soda to unclog your sink drains. To get accidental spills out of the carpet or the fluffy rug in the living-room, just pour a little bit of beer on it, let it do the job for a few seconds and sprinkle some baking soda on. Rub it and leave it to dry. Vacuum to get everything out. Baking soda can also be used to get another kind of “accident” out of the mattress and if you have small children, you know what I mean. Just sprinkle baking soda on, after putting a few drops of white vinegar, all over, rub, leave to dry and then vacuum everything out. You can use this trick on pet “accidents” on couch, rugs or carpets. To get the smell out of the fridge, you can use a lemon, cut in half. Just place the lemon in the fridge and leave it in there until it starts to look “tired”. Get it out and throw it away. You can also use half-cut lemons to get the smell of raw meat, onion, fish or garlic out of wooden cutting boards. Sprinkle on some sea salt or baking soda, and then rub it all over with the lemon cut in half. Generously rinse to finish.